Unfortunately, it's badly redirected loop since its launch. Because the page isn't redirecting properly, I'm still experiencing nothing. Fatal problem w/ any browser. I can certainly understand how Google would want to avoid a Buzz-like repeat. On the other hand, what would stop Google from simply allowing people to click on already existing contact lists, rather than requiring users to start a new list from scratch? I really can't believe that I should have to select a name and photo, and build a list of friends for each different Google service. Google's offerings are a total mess. Interesting service. But I wont directly jump on this. I will prefer to wait & see how other friends react on this. 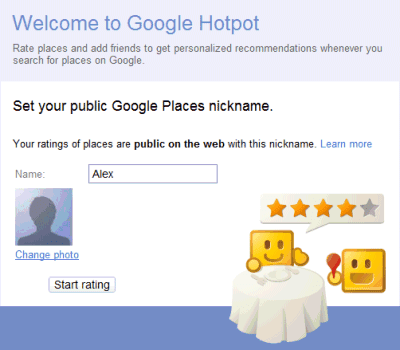 I have heard a little about google hotpot but do not have much more information about. After reading the above post I got idea about it and now I can understand more about google hotpot. I want to give hotpot a try, but I just can't access the page (http://www.google.com/hotpot), every time I point there I get the following error: "This webpage has a redirect loop.". Can you give me a hand with this? Furthermore, you misunderstand the service. You write: "To get useful recommendations, you first need to share your ratings with your friends, but Hotpot's main problem is that it's not connected to any social network." This is flat out wrong. You don't need a single friend on Hotpot to make it work. 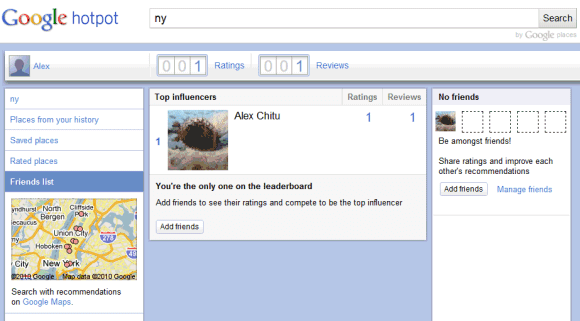 It's a recommendation *engine* with a social layer - *not* a social network. As you might recall, Google writes: "When you rate places you like, we’ll tell you about other related places you’ll love".